Friday, November 11, 2011. 11/11/11. The day of the wounded saints, when all eyes weep. It’s a foggy night in Durham, North Carolina, but the Belmont Bruins can see through the mist. Cameron Indoor Stadium is in a state of shock and fear as the Bru-Crew take Duke right to the brink. With wide eyes, the Crazies watch Andre Dawkins hit a late 3-pointer. Their team escapes, and the Bruins slip out into the fog. “We were never here,” they seem to whisper, but they know what they saw. They can never forget. That’s the start of my new historical fiction novel, The Eve of the Bruin. I actually don’t remember what the weather was like that night, and the “wounded saints” bit was just a bit of dramatic flair, but the story of the game was true. On 11/11/11, the Bruins lost to the Blue Devils 77-76 in the first game of the season. The conclusion everyone drew at the time was, “Man, Duke is going to be terrible this year.” The truth, though, is that Belmont is pretty damn good. After the close call in Cameron, the Bruins went on to win the Atlantic Sun conference with a 16-2 record, and Friday night they play East Tennessee State in the semifinals of the conference tournament. With Wednesday’s quarterfinal win, the Bruin winning streak stands at 12 games, and they’re poised to become a really terrifying 12-14 seed in the NCAA tournament. It’s high time we learn a bit more about the Bruins. As usual, we’ll be Q&A’ing this baby. 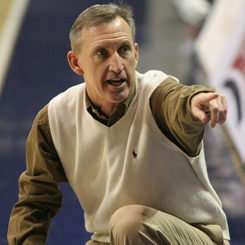 A: The venerable Rick Byrd, who has been with Belmont since the NAIA days in 1986. He’s compiled a 518-278 record with the Bruins, and is one of only five active coaches to have surpassed the 500-win mark at a single school. He’s also a super dapper gent who ain’t afraid to sport the polo sweater vest. Since Belmont joined the A-Sun in 2001, Byrd has led the Bruins to four NCAA appearances. 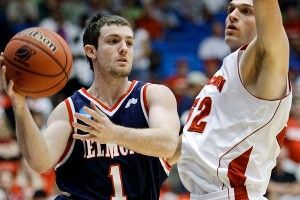 He lost handily in the first round three times, to Georgetown, Wisconsin, and UCLA, and in 2008 came within a point of beating 2-seed Duke, only falling when Gerald Henderson hit a layup with 11 seconds left. That makes twice that Byrd has lost to Duke by one, which has to be annoying for both parties. Q: What is this team all about? A: Offense, offense, and more offense. Some numbers, courtesy of Mr. Ken Pomeroy: Belmont is 11th nationally in offensive efficiency, sixth in effective field goal percentage, and fifth in 2-point field goal percentage. The Bruins also assist on 62.7 percent of all made field goals, the 13th-best rate in D-I. The only areas of struggle are getting to the line and having shots blocked. They’re solid, but not exceptional, on defense, and they skew toward average on the offensive and defensive boards. Q: What players should we watch? A: The most fun is probably Drew Hanlen, a 5-foot-11 senior guard who shoots 48.9 percent from 3. That’s the second-best in the country among players with at least 100 attempts, only percentage points behind Wagner’s Tyler Murray. He averages 11.1 points per game, along with 3.9 assists. He’s the classic upstart mid-major guard with the potential to catch fire and lead an upset. And holy hell, this is one serious kid. He already has a skill-development company called Pure Sweat Basketball, which features a 925-page handbook on how the game should be played. Among the players he’s worked out? Kevin Durant and Amar’e Stoudemire. He’s also worked with college prospects from 32 states. Dude knows basketball. The leading scorer is Kerron Johnson, a 6-foot-1 junior guard who averages 14.1 points per game and dishes out 5.2 assists. Ian Clark, another guard, averages 12.4 points and shoots 39.5 percent from deep. The bigs, 6’9″ Mick Hedgepeth (great name) and 6’10” Scott Saunders, both average around 10 points and five rebounds per game. At 6’6″, J.J. Mann is an inside-out player who can rebound and shoot. They’re an experienced team, too; of the six top players, only Mann is an underclassman. Q: What’s the tournament potential here? A: Joe Lunardi has them as a 14-seed in his latest bracketology (matching up against Georgetown, which would be ideal for the Bruins), and with experience, shooting ability, and a long win streak, Belmont will be incredibly dangerous. It’s very rare for a 13- or 14-seed to make the Sweet 16 (only happened once since 2000, whereas 19 12-seeds have made that round since 1985), but if Belmont stays that low and lands a favorable draw, this could be the year to buck the trend. Q: Are they good enough to make the tournament without winning the A-Sun tournament? A: Ah, good question. With so many tough mid-majors around the country, and the depth of the power conferences, I would guess that no, there’s no room for two A-Sun teams. Tonight’s game is at 6 p.m. Eastern, and the conference championship will be Saturday at 7. To make the dance, Belmont can’t afford a hiccup. Conference championship week is here, and Saturday may be The Eve of the Bruin (self-published, to be released as an e-book on March 24).